I always look forward to this time every year... because it is the annual ForestMan (and BoskMan, and ForestMan Half...) report from organiser Richard Iles of RaceNewForest. If you've read any of the previous reports - all linked below for your convenience - you'll know why! 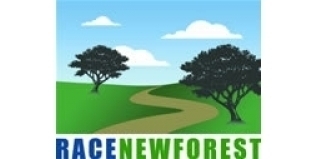 (And for those not in 'the loop', the ForestMan is a very tough, iron-distance triathlon held in the New Forest by the appropriately names RaceNewForest. With just over 100 entrants it's far from the biggest event in the world, but for many, they rate it as the best...). "How Mrs Ward's Exceptional Flapjack Saved The Day"
A “smiley” day from beginning to end!! ForestMan came into being at a time when there were few long distance events in the UK [Ed. you can read the first year report HERE]. It was designed to be a testing course in scenic surroundings that would attract competitors seeking a personal challenge rather than the easiest option... if such a thing exists when you're out there all day. A course that we would have jumped at the chance of taking on ourselves. (It has been going a while now!!!). With few whistles or bells there is little of the razzmatazz that surrounds the more corporate events but year after year it manages to generate it's own special atmosphere with a camaraderie and spirit between competitors and a bond between them and the marshals which harks back to the early years of our sport. Alongside it, The BoskMan offers an ideal opportunity for a fantastic workout ahead of an 'A' race IM event and this year a Middle Distance event was slotted in as well. The three events complemented each other well and it was gratifying to hear reports of the "cross event" support between athletes. The point of the events is absolutely not the "winning" or "losing". It is genuinely about the day itself and the extraordinary efforts that people put in for all different kinds of reason. 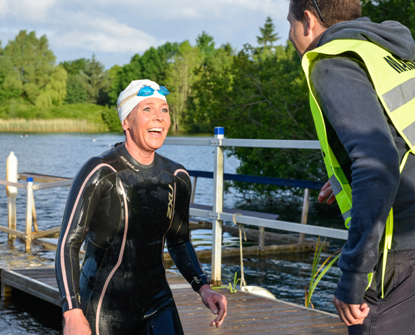 It is a "throwback"…..much like it's organisers….and for that reason I love it and value it's place in the Triathlon calendar! Stuck, as we are, both Joanne and I, at the start and finish areas, we get to see little of the event unfold. We get snippets of information and feedback from finishers and marshals: I get to chat to a lot of the athletes and then I sit down about now to try and summarise the day. I can say, with a degree of confidence that it was our windiest ForestMan day and the direction of the wind could not have been less helpful to the competitors. The way in which competitors managed the conditions was astonishing to me. I had expected a higher attrition rate than usual (exhaustion, flats, cut-offs missed). Instead there were a minimal number of withdrawals.. I think maybe five across the three events out of 250 starters. Our marshals continue to be the best in the business. All are stars and those who put in the 17 hr shifts have been inducted into the RNF Hall of Fame. Never try and pay for a race entry again or we will be offended. Our aid stations provide an almost à la carte array of additional items and are life savers. This year I have received an email from a runner so grateful for their help he swears he would never have got back to Sandy Balls without them. He wasn't actually one of our competitors... just lost on a training run….but eternally grateful nonetheless. There was also some exceptional racing going on. All of it competitive but with such mutual support and congratulation between the protagonists that it had more the feel of "club racing" than anything else. A family gathering as it were! If you take a look at the results you will be able to see the bare facts but to see all these athletes sitting, chatting and enjoying each others company and achievements at the finish line is a privilege I value greatly. Some old friends came back to see us after a few years absence. Good to see you Phil, Slacko (and Mrs S)!! Chris Goodfellow's new ForestMan course record of 9:39:51 included a sub 4:55:00 bike split in "testing" conditions. And what a charming bloke!! 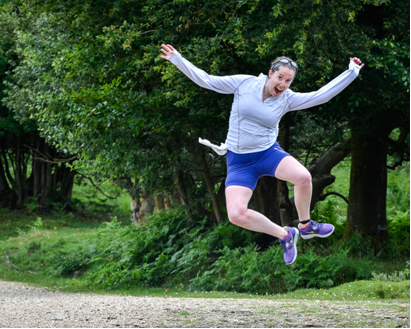 Ginny Mills, in only her third triathlon, won the Ladies ForestMan title…..following in the footsteps of husband Austin, who was victorious (in the men's race), a few years ago!! Our friend Nick Baldwin returned to the Forest and produced a very strong performance in the BoskMan to pip Sam Baxter a reversal of their Wimbleball finish positions. Both in great form at present. Buddies Tracy Cook and Lizzy Hutson left it late to enter and then took first and second in the Ladies Boskman with Tracy producing a particularly strong performance on the day to finish eighth overall. Most things went well but some will be better next year particularly with three events rather than just the two! Joanne has now stamped on the printer which refused to "talk" to the laptop and caused her to have to write out the ForesMan results by hand. On the plus side at least it wasn't Ironman Austria or similar!!! We had fun and hopefully that came across. ………….but Mrs Ward's exceptional flapjack saved the day! Stiill "a "Smiley" day towards the end! !